We are in the process of introducing a new design line. Our new designs line was inspired by a diagnosis of cancer. We had no idea he was sick. He thought he had a broken rib. When we learned we were shocked. Speechless. "What's it going to do? Give me a tumor?" We know right then and there that this still unknown diagnosis had just thrust us aboard the gallows-humor-train and that his snarky tumor remark would be an instant classic. Many more sick jokes and ideas (see what I did there?) flowed that day and in the days following as we moved through the initial shock of it all. Soon, Jeff teased that we should create a new line of macabre designs for our store based on our cancer diagnosis experience and call it "Stage IV Productions" because, well, cancer happened. Now that you have read our story, go to our shop at www.ShopJustWish.com and take a look around at our updates and new designs. We appreciate your kind words and positive thoughts and prayers. Thank you all for being so kind to us! 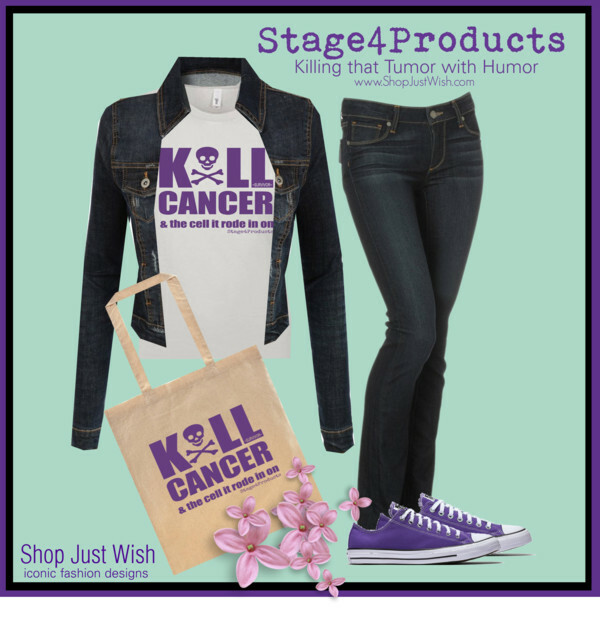 Stage4Products - Killing that tumor with humor.